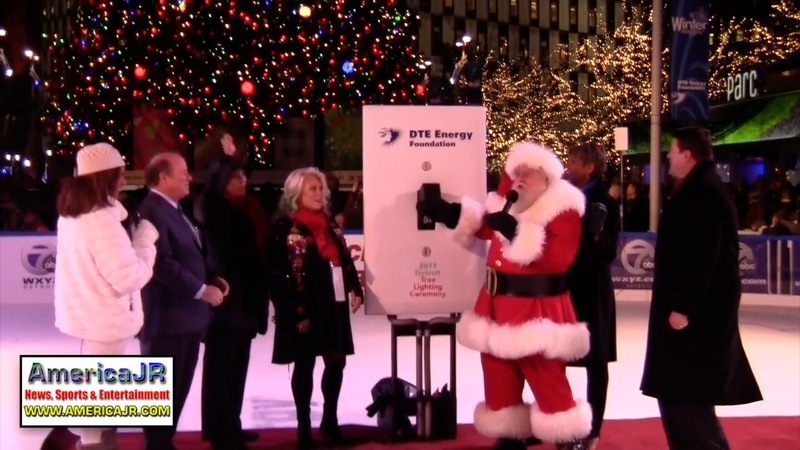 AmericaJR’s Gloria and Jerome Rzucidlo were LIVE at Campus Martius Park for the 14th annual Detroit Tree Lighting ceremony. The event began at 5 p.m. on Friday, November 17 and was free to the public.R&B and Motown star KEM, “Queen of Blues” Thornetta Davis and soulful funk band Jessica Hernandez & the Deltas performed on the main stage. It featured performances by Olympic figure skater Jeremy Abbott, the University of Michigan Collegiate Synchronized Skating Team, the Arctic Figure Skating Club, The Detroit Skating Club, The Dearborn Senior Crystallettes and more. At the end, a Michigan-grown, 60-foot Norwegian Spruce wrapped in more than 19,000 multi-colored lights and ornaments was lit to kick off the holiday season.